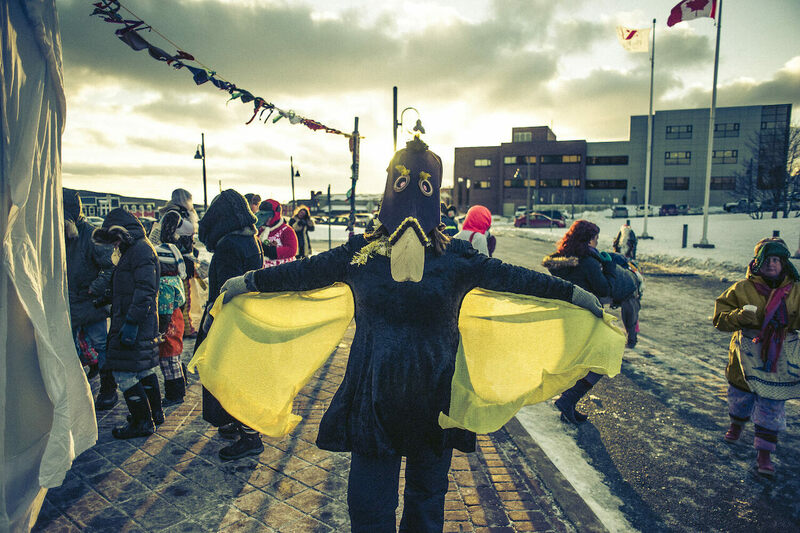 One day each year, in St. John’s, Newfoundland, the streets are filled with misshapen, masked figures. They are wrapped in quilts and oversized jackets, or bright boots and distinctive dresses, with undergarments worn on the outside. Their faces are obscured behind gruesome disguises, lacy veils, giant horse heads, or beneath ghost-like pillow cases. These are Newfoundland’s mummers, the latest iteration of a centuries-old tradition that has its roots in Europe but is entirely unique to this Canadian island. More than a thousand people come out to the Mummers Parade each year, to feel what it’s like to shed their normal identity for at least a few hours. 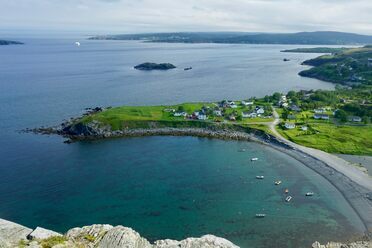 Newfoundland is as a far east as you can go on North America’s Atlantic seaboard—if you start in Maine and head northeast, past New Brunswick, Nova Scotia, and Prince Edward Island, eventually you’d reach this vast island. St. John’s, the capital, has a similar feel to a historic New England harbor town, where the water’s never far away, only here the row houses are painted bright red, blue, teal, yellow, even purple and salmon pink. For many long years, Newfoundland was a place mostly isolated from the rest of the world, dotted with fishing communities that were mostly isolated from each other. It’s a classic set-up for divergent evolution, where seclusion incubates unique traits. The island’s tradition of mummering was exported from a very specific part of the British Isles and refined into its own particular species, which, threatened by change, almost went extinct—until just a few years ago, when a local organization intervened in its imminent death and resuscitated mummering for the modern world. The exact origins of the word “mummer” have become obscure, but they likely had to do with masks or the act of disguise. In England, mummers have dressed up and performed Christmastime plays, which often told the story of St. George and the Dragon and featured themes of winter and rebirth, for many centuries. In some places, mummers’ troupes would also go from house to house to raise funds for their celebrations. Over time, mummering traditions diverged and developed from place to place within the British Isles and spread, with British settlers, across the world. Philadelphia’s Mummers’ Day Parade is derived, in part, from Britain’s mummer plays, in combination with Christmastime rituals that other Europeans brought to the city. But as mummering has been passed down, it’s morphed in each place into an idiosyncratic tradition. In Newfoundland, mummering has usually meant, in its most basic form, wearing a costume that disguises your identity and going from house to house, visiting your neighbors. It’s a game of sorts: at each stop, the hosts would try and guess the identity of the mummers. Mummers also have to disguise their faces, and they worked with what was available—an old lace curtain or tablecloth, a pillowcase or flower sack with eyes cut out and, perhaps, a face painted on it. Mummering in Newfoundland is all about reversals—turning the normal world topsy-turvy. Men might dress as women and women as men. Friends dressed in costume became strangers, and the odd creatures that visited in the night were revealed to be close friends. But it wasn’t all innocent fun. Many towns had a hobby horse haunt their streets—a ghastly figure whose costume might be made from actual bones and who’d chase anyone who wasn’t dressed as a mummer. In the 1800s, parties of drunken mummers would walk the streets with sticks, or bladders full of rocks tied on, and they would use the cover of their disguises to beat others up. Sometimes the hobby horse skull would be used as a weapon. In 1860, a fisherman in Bay Roberts was killed with an axe by three masked men. After that, authorities started cracking down on mummers’ activities, requiring mummers to apply for a permit. When most mummers flouted that requirement, the government banned the practice altogether. For decades, up until the 1990s, mummering was illegal in Newfoundland. In 2009, mummers first began returning in force to Newfoundland. On a December afternoon, hundreds of people converged on a gym in St. John’s, ready to march through the streets in their elaborate (and not-so-elaborate) costumes. This parade had been organized by the Heritage Foundation and the local Memorial University’s Folklore Department, in a bid to revive mummering from its senescence. Even that first year, it worked. “Just the fact that 300 people, dressed in disguise, showed up sober on a drizzly Sunday afternoon for a parade that had never happened before was astounding,” wrote Davis, who was the festival’s original coordinator. Now, each year, hundreds of people march in the parade. It starts with the “rig-up,” where mummers can pull together a costume from a dozen tables piled high with donated clothing and hobby horse heads. More experienced mummers might give tips on the best costume strategies; people with accordions and musical “ugly sticks” might start an impromptu jam. It captures a bit of the spontaneity of the old tradition, when you might get a call asking “Do you want to go out mummering?” and have an hour to pull a costume together. Dressed as mummers, strangers feel an unusual freedom to talk and tease. One year, a man was dressed as a hobby horse, and a woman started petting the horse, petting his mane. The horse started nuzzling back, being soft and cuddly, until all of a sudden, he turned mischievous and started snapping at her with his wooden teeth. She screamed, and slapped the horse in the face. “You saucy horse!” she told him. For a few hours, at least, you can dance and play—and no one will know who you are.